When I was on maternity leave I decided to go chemical-free as much as possible. I tried a few natural methods of washing my face (the oil cleansing method and honey to name but a couple), used coconut oil as a moisturiser and Dr Bronner’s castile soap as a shower gel. I even washed my hair with bicarbonate of soda and apple cider vinegar until an upcoming wedding made me question whether my hair was really looking as good as it could (or even socially acceptable). I really wish I’d kept that last one up and seen it through as I would love to be in the position where my hair more or less looked after itself. Maybe I’ll try it again, although I guess I need to look presentable in the office now. I’m still using the Dr Bronner’s and I’ll go back to the coconut oil when I’ve used up a few of the things I’m trying to get my rosacea under control. My favourite thing that I tried though was the homemade deodorant recipe from the book Organized Simplicity by Tsh Oxenreider of the blog The Art of Simple (formerly Simple Mom). I love love love it! The only time I use traditional anti-perspirant is if I haven’t got time to let the homemade stuff dry. 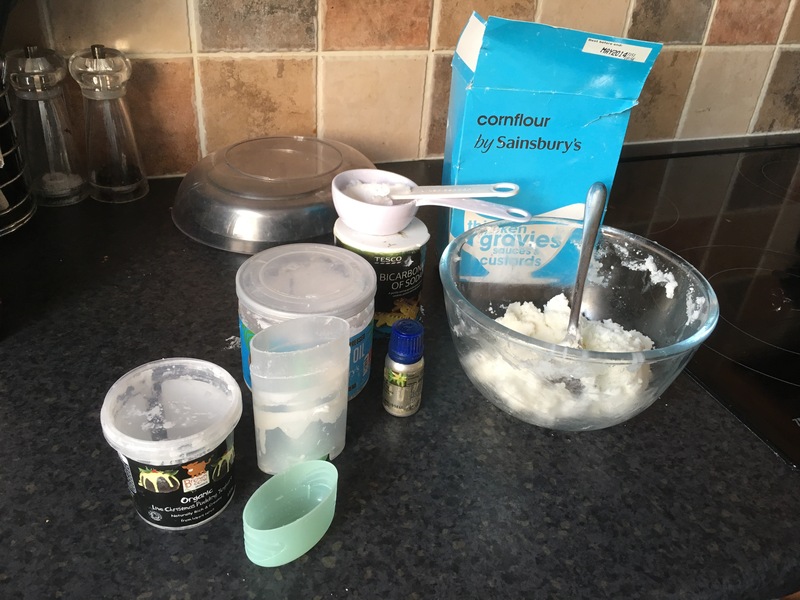 Mix the bicarbonate of soda and cornflour together, then add the coconut oil one tablespoon at a time until all the dry ingredients have been mixed in. You’ll feel like it’s never going to happen, but keep mixing and eventually the oil will start to melt and it will blend. Add a few drops of essential oil if you’d like a fragrance (I’ve used rose absolute in my most recent batch). Take a clean, empty stick deodorant container and spoon the mixture in, twisting down the inside as you go. I’ve found that the recipe above makes enough to fill one old deodorant container and a 150ml lidded yoghurt pot saved from our veg box days. I keep the leftovers in a cupboard and top up the container as required. Coconut oil will melt at 24 °C so it may need to be kept in the fridge at times – but that makes it lovely and cooling. I really do find that it works, although it can be rather sticky when you first apply it. I don’t notice any odour and very little perspiration. I’m definitely a fan of this natural approach, not just because of the potential implication of antiperspirants in the causes of breast cancer, but also because I know exactly what is in it and there’s no irritation. It’s non-toxic and quick and cheap to make. It’s also fun to make because of the way the dry ingredients blend with the melting oil. I’ve started to find the smell of shop-bought antiperspirant deodorants quite overpowering, but using my own homemade deodorant is like a sweet little secret.